Moving may often be a costly endeavor, especially if you want to move a huge apartment or an entire house. So it is not surprising if you want to look for a way to cut the costs down a bit. One of the things that most people do in such a case is to come up with free moving supplies. 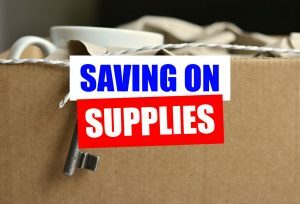 Indeed, finding cheap or free packing materials can cut the costs a bit, but in all honesty, it may not be worth it. As professional movers Chicago we know a thing or two about the quality of moving supplies. Today we are going to tell you about certain items that are perfectly okay to get for free, but we will also mention some others that you should most likely avoid. Let’s go! What is the first thing that comes to mind when you consider packing? Boxes, of course! So where do you go to look for boxes? Most likely to your local grocery or liquor store. That is perfectly fine, of course, if you are going to transport primarily clothes and bedsheets. However, the cardboard boxes you will get from these places are not sturdy enough to house anything else. We advise that you do not try to save up money on moving boxes. But you don’t have to buy them either. Instead, you may consider renting plastic packing boxes, which are specifically designed for moving. They are much sturdier and offer better protection for your belongings. When it comes to safe packing, padding is one of the most underappreciated things. Most people forget about it, but you should not. Luckily, you do not really need to spend any money on it. Here you can go with free stuff you can find, such as old newspapers (you can find these with your neighbors for example), packaging materials from grocery and liquor stores, as well as old clothes. Of course, you can spend some money on bubble wrap, but it is not necessary for most cases. We use it when we pack your items, because we want to provide the best protection possible, but if you want to cut the costs, it is perfectly reasonable to go without it. When you are trying to save money on a relocation, you may actually have to spend more. Why? Because cost-cutting is not efficient if you do not go with a reputable company. This is why it is much better to hire professionals as soon as possible. That way you will get a lower price and a great service. They will save you time, and also money. Not to mention that their packing expertise is wonderful news for your items. That being said, it doesn’t mean that high quality movers are extremely expensive. We for example offer personalized quotes and always strive to get the best price for our clients. If you want to start the moving process with us, just give us a call and we will tell you more about it!